James Cannon won’t be involved at Sixways on Saturday after being injured against Munster. 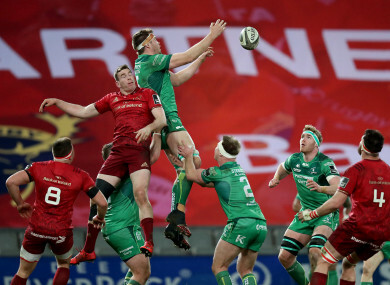 James Cannon claims a lineout against Munster. JAMES CANNON IS Connacht’s only fresh injury absentee resulting from Saturday’s Guinness Pro14 defeat to Munster. The English-born lock picked up a shoulder injury as the western province suffered a 39-13 loss at Thomond Park. Connacht say the injury will keep Cannon out of action “for a number of weeks”, ruling him out of Saturday’s penultimate Pool 5 game in the European Challenge Cup. Kieran Keane’s side travel to Sixways to face Worcester Warriors, knowing that a win will guarantee them a place in the quarter-finals. Cannon is likely to be replaced in the side by Ultan Dillane, who was rested for the trip to Limerick. Fellow Ireland internationals Kieran Marmion and Bundee Aki should also come back into contention for the meeting with the Aviva Premiership side. In more positive news on the injury front, both Cian Kelleher and James Connolly are back in training this week after recovering from head and calf problems respectively. Email “Injury rules Connacht lock out of European showdown with Worcester”. Feedback on “Injury rules Connacht lock out of European showdown with Worcester”.